Hungarian rabbi and Talmudist; born about 1760; died in 1830 at Novo Mesto (Waag-Neustadtl), Hungary. He officiated first at Szerdahely, and subsequently, after 1810, at Waag-Neustadtl. One of the most prominent Hungarian rabbinical authorities of the early part of the nineteenth century, he was distinguished for his nobility of character. Stories on his high views of life are still current in many districts of Hungary. He was classed among the foremost of Jewish philanthropists. Deutsch often gave a poor applicant money without counting or even looking at it; and, if his purse was exhausted, he would give him any object of value that happened to be at hand. Deutsch was also celebrated for his wit and humor, of which he often made effective use in his capacity as preacher. His piety was such that he never raised his head, regarding it as inconsistent with true humility and the fear of God; and he never looked beyond his immediate surroundings—"the four cubits." 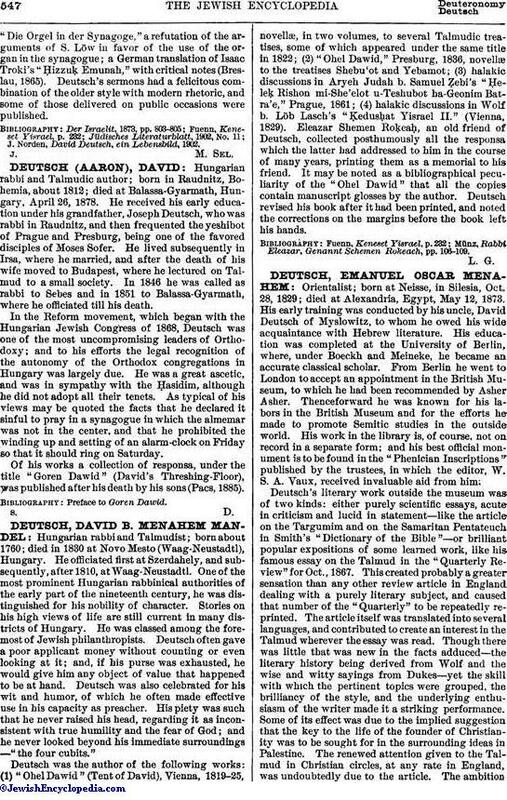 Deutsch was the author of the following works: (1) "Ohel Dawid" (Tent of David), Vienna, 1819-25, novellæ, in two volumes, to several Talmudic treatises, some of which appeared under the same title in 1822; (2) "Ohel Dawid," Presburg, 1836, novellæ to the treatises Shebu'ot and Yebamot; (3) halakic discussions in Aryeh Judah b. Samuel Ẓebi's "Ḥeleḳ Rishon mi-She'elot u-Teshubot ha-Geonim Batra'e," Prague, 1861; (4) halakic discussions in Wolf b. Löb Lasch's "Ḳedusḥat Yisrael II." (Vienna, 1829). Eleazar Shemen Roḳeaḥ, an old friend of Deutsch, collected posthumously all the responsa which the latter had addressed to him in the course of many years, printing them as a memorial to his friend. It may be noted as a bibliographical peculiarity of the "Ohel Dawid" that all the copies contain manuscript glosses by the author. Deutsch revised his book after it had been printed, and noted the corrections on the margins before the book left his hands. Münz, Rabbi Eleazar, Genannt Schemen Rokeach, pp. 106-109.